SINSINAWA, Wis.—Sister Joeann Daley, OP, will be featured in “The Evolution of the Artistic Imagination” at Sinsinawa Art Gallery, Sinsinawa, Aug. 4–Sept. 28. An opening reception will be held 1-3 p.m. Sunday, Aug. 7, beginning with an artist talk. Sister Joeann is known for creating intricate art with many layers that blend color, texture, form, and function. Her art is quickly recognizable and invites the viewer to wander through her imagination. This exhibit traces the evolution of this artist’s creative life, beginning with Sister Joeann’s 2010 jubilee celebration of 50 years as a Sinsinawa Dominican sister and spiraling back through the places where she has lived and worked. The pieces on display will include works from as far back as 1968 to Sister Joeann’s latest creations with small Styrofoam containers she calls “Styroart.” This new technique came about when she lacked paper for notes at a conference and began writing on an empty Styrofoam cup. Sister Joeann applied her years of printmaking knowledge to this new endeavor and has engraved and colored her way to a form of art that observers find both intriguing and astounding. The entire piece is covered with dynamic shades in her signature style. 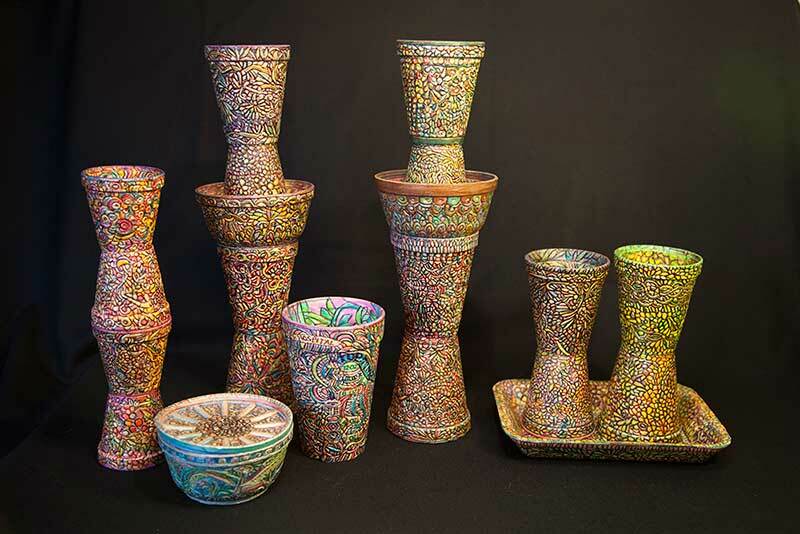 This series comprises more than 200 individual vessels, each taking about 12 hours to complete. 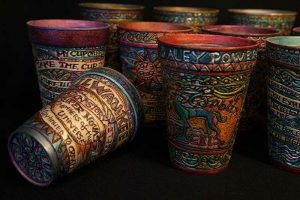 Once finished, she stacks the transformed cups and bowls in imaginative configurations. The clusters tell the story of her life, expressing joy, gratitude and reverence while acknowledging people, places or events that she holds dear. Other pieces will include a compilation of Sister Joeann’s sculpture, drawing, lithography, etching and collage. For more information, contact Michelle Till at (608) 748-4411 or visit our website at www.sinsinawa.org. Sinsinawa Mound, the Motherhouse for the Sinsinawa Dominican Sisters, is located in southwest Wisconsin on County Road Z, off Highway 11, about five miles northeast of Dubuque.